Maple-Glazed Roast Pumpkin: Veggies are Yum! It’s pumpkin time! Actually, it’s fall, and October is past and I didn’t have a chance to carve a pumpkin for Halloween. So, I served my Halloween pumpkin up for dinner! With maple syrup, because I’m Canadian like that. Ever eaten oven-baked sweet potatoes? That have been baking on a low heat for a long time? They get all sweet and caramelized and oh so delicious. I thought I’d try something similar with pumpkin slices, except I also treated them to my acorn squash treatment — a brown sugar dip before roasting. And then the roasting. And then the maple syrup glazing! The result? Um, yum! I love maple syrup glazed anything, and adding maple syrup to my beloved veggies just makes them better! Slice peeled pumpkin into 1 inch thick slabs. Mix vegetable oil and brown sugar and coat pumpkin slices in the mixture. Place on a cookie sheet and baked at 400 degrees Celsius for 20-30 minutes or until the bottom of the slices are golden and caramelized, and the squash is easily pierced with a fork. Removed from oven and brush with maple syrup twice. Serve warm and enjoy your maple-enhanced veggies! By the way, thinner slices of pumpkin caramelize more quickly in the oven. Oh, and you could substitute in many other sorts of squash for the pumpkin in this recipe. I mean, really, you can’t go wrong by roasting a squash and then glazing it with maple syrup, amirite? Next Post: Pumpkin Gnocchi? Best Ever Almond Bundt Cake? Or perhaps my incredibly delicious Faux Cream Cheese Icing? So many delicious things, so little time to blog about them! This entry was posted in Vegetarian Side Dishes on November 27, 2017 by Margaret. Thanks, B! Maple-glazed anything is delicious! 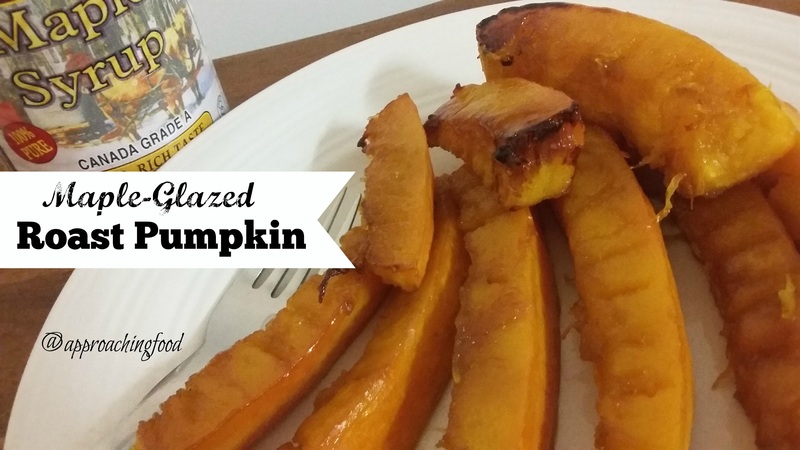 This is a great recipe for Roasted Pumpkin which we love! Hope you are having a wonderful week and thanks so much for sharing with Full Plate Thursday.